Dave Brevik thinks $200 is a fair price for all of the game's starting content. Whether you need to buy web fluid, bulletproof clothing, or innumerable pairs of purple pants, no one ever said that being a superhero was cheap. 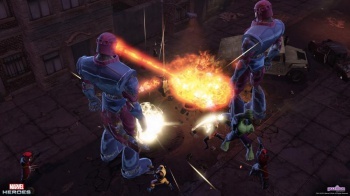 In fact, if you're looking to pick up absolutely everything for the launch of Marvel Heroes, get ready to drop $200. While the upcoming MMORPG is free-to-play and premium packs start at $20, Gazillion Entertainment CEO Dave Brevik thinks that the Ultimate Pack is priced to sell. "You have to realize how much you're getting for that Ultimate Pack," says Brevik, who is perhaps best known as one of the leads behind Diablo and Diablo II. He points out that people - including himself - routinely spend more money than this on games like League of Legends and World of Warcraft, and that games in this price range are hardly unheard-of. "There are plenty of Collector's Edition-type things that are well over $100. This does happen." If you want all the content that Marvel Heroes offers and don't have time to earn it, Brevik also explains that the Ultimate Pack is cheaper than buying everything piecemeal. "It's an upfront discount. That's why it seems expensive, but in the long run you'll save quite a bit of money." The Ultimate Pack does boast a lot of content: It unlocks every playable hero, four exclusive costumes, $100 in in-game currency, early game access, permanent bonuses for XP and item collection, and forum perks. Brevik also stresses that the pack is completely optional. Not only are most premium packs much cheaper, but to jump into the game and start playing costs nothing at all. However, while players can earn every hero and most costumes through dedicated play, a few items will only be available to premium purchasers. "In a lot of ways we're giving away almost everything," Brevik continues. "I would like to say everything, but it is technically not correct. But 99 percent of everything is attainable in the game." Fans have also levied negative charges against the beta's storyline and graphics, but Brevik assures them that these will be ironed out by the game's launch. "[The fans] have to realize it's not done yet. It is a beta. We have definitive plans." Until then, take solace in the fact that even if you buy the Ultimate Pack, it's considerably cheaper than your own private battle jet.